I am away from Abingdon for a couple of days but have found something of Abingdon interest in the form of an old leaflet, dated 1990, from a charity shop in Cumbria. 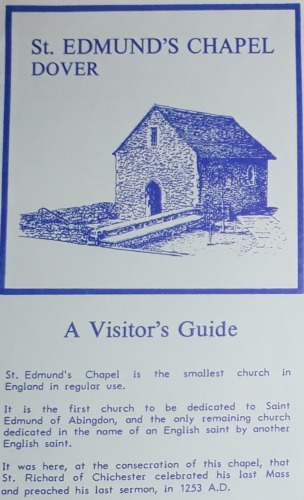 It is a 20p Visitors Guide to St Edmund’s Chapel, Dover. The small chapel, build in 1252-3, somehow survived the centuries before being restored between 1966 and 1968. In 1544 St Edmund’s Chapel and other nearby properties were surrendered to King Henry VIII and it stopped being used as a chapel. Other buildings were built about it and it got forgotten, until its significance was rediscovered in 1883. During WWII two shops that hid it from view were destroyed during a bombardment but the chapel building survived. It even survived the 1960s redevelopment of the area thanks to the efforts of a local priest. The chapel website has a lot of detail about the chapel dedicated to St Edmund of Abingdon, far more than the leaflet. There was also a chapel dedicated to St Edmund of Abingdon, near St Edmund’s Lane in Abingdon, but all record of that has vanished. This is a lovely chapel and has stone seats set in the wall. Pilgrims who were infirm would use these seats hence the saying “Gone to the wall”. The chapel is also the only church or chapel dedicated to one English saint – Edmund of Abingdon – by another English saint – Richard of Chichester. I’ll remember that, Miss Rabbit! The pilgrim source for the phrase is interesting. Where did you come across this origin? None of the dictionaries I have checked has this. The chapel’s website is very informative. Thanks for this discovery, Backstreeter! Here’s a true story – about ten years ago I was in the reception of an Abingdon company waiting to see the M.D., the receptionist asked me if I’d lived in Abingdon very long? Yes I replied, all my life and so far traced my family back to 1775 here, do you know St Edmund’s lane she replied, I do said I my father was born there, do you know number ** ? Yes why do you ask? Did you know anyone who lived there and did they have a dog? Yes it was Mrs N***** and yes she had a dog. I remember her well looked very much like Barbara Cartland and had a Dalmatian dog, why do you ask? Well she said, I’ve not long moved in to the house and I’m convinced it’s haunted! What makes you think that said I? Every morning I come down stairs and my orniments that were on the mantle piece are placed carefully on the floor and often there is an overwhelming smell of dog ! Why me? I do funeral rites, not ghost stories. Does anyone else have an Abingdon ghost story? Once upon a time there was a town called Abingdon. Lots of councils had their hands on different parts of the town and often the towns folk of Abingdon in exasperation would often roll their eyes at having to draw the attention of keepers of the town (those councils) that there were issues that needed addressing. After doing so (by the townsfolk) the keepers would often say “It’s ok…we have decided we know what is best for the town”. On occasion there would also be an MP who would get involved – often by writing a strongly worded email, as strongly worded emails are what lobbying is all about, and only MPs can do ‘lobbying’. Sometimes, when the towns folk – or, the great unwashed as they are colloquially considered – would scream and shout and plead for our MP do try and do something about town issues traffic, roads, dire housing etc. Often the MP (or keepers) would then often say to the unwashed “it’s ok great unwashed, I have decided I know what is wrong with the town – there are issues with traffic, and roads, and awful planning decisions. But, rest assured, I know that my processor wrote a strongly worded email about this before, but this time; I am going to write a strongly worded email as well, only this time I am going to use italics, and, even, where it will be most effective, I may use bold as well”. In an effort to look like things are being done – apart from the lobbying, and the “financially sensitive meetings” behind closed doors as, well, finances don’t affect us…and anyway, we wouldn’t understand…then it would be decided to spend lots of unwashed money on consultants. The first tranche of money that is given to the consultants by the keepers, is for them – the consultants – to come and stay in a nice hotel (but somewhere else as it’s important for them not to be in Abingdon any longer than absolutely necessary) and when they do come to Abingdon (when it IS absolutely necessary) they have very much earned the money of the unwashed because…they have observed that there are issues with traffic, and roads, and dire development etc. Now that the keepers of the town have actually paid good money, now they know what the issues are; and they can report back to the unwashed that the keepers where correct in their observations that there are issues with roads and traffic and dire development etc – because they have paid good money (not THEIR money – our money) to have it confirmed that there are issues with the roads, and traffic and poor planning. Never let it be said that a true fact cannot be any truer – especially when it is paid for – by someone else. Now that consultants are involved the great unwashed can be reassured that the issues are going to be tackled. Especially, as is pointed out to them by the intelligencia, now the keepers know what the issues are (the traffic, the roads, the dire development, the healthcare the children’s services etc). Now we can really start to attack the nub of the issue. With only a little bit more money spent (not their money, unwashed money) the keepers can get some ideas from the consultants on how to fix the issues. Interestingly, a lot of the ideas are also available for free. However, never let it be said that an idea is never as good as a free idea, unless it is paid for – using someone else’s money. And, the only thing better is if a consultant can come up with their own independent ideas. Of course, when presented to the great unwashed, who actually live here, and holes are picked in those independent ideas, and reported back to the keepers that these ideas are rubbish we are reminded, that no rubbished idea by people “who know” (for free) can ever be better than a “rubbish” idea that you have paid good money for (not their money, our money). And then, before we (the great unwashed) know it the great plan to resolve issues has been implemented, and have been shown, in practice, to be totally awful and doesn’t resolve the issues at all. However, never let it be said that an awful idea that doesn’t solve any issues is never as good as an awful idea that doesn’t solve any issues that you have paid a lot of money for (not their money, our money). All the while the MP hasn’t even logged on to her email yet to start her lobbying! When the unwashed try and fathom how or why the keepers were so happy to part with our money, and it turns out it’s all the fault of the consultants who were paid to give poor advice. Who were paid to implement that poor solution; no one ever hears anything ever again. They have moved on, or disappeared…like a ghost. Daniel – are you standing for the Council in the coming elections? I hope so, because we really need people who feel so strongly that the way things are done now is wrong, to get stuck in and start changing things. If, as you say, “they” don’t listen to the people, now is the opportunity to get on the inside and speak from there. Sarah here’s another true one for you, my old English teacher was Mrs Nicholson, wife of the then town clerk, Ernest, they lived in Old Abbey House ( this was the 60’s) her kitchen was the stone single story building on the left of the house and she would often tell us how, at night, she see a man (ghost) walk by the window, this was a regular occurrence! Horse’s mouth…. thank you. Just the sort of thing I was after! I have thought about it Hester, but the only way to do it to have any effect is if every ward has an independent candidate, and every independent candidate wins. Then, less locally, The Veil will also need such neutrality as well. If there’s not an independent candidate in each ward, there’s no point. Maybe I should be a consultant instead? I have loads and loads of bad ideas…. As I was driving along the A34 I saw a heavy machinery in a field by Abingdon preparing the ground for the first 200 houses of a massive housing estate to be built. At the edge of the field I thought I saw a big queue of people all by a notice board with the sign, ‘get your bicycle vouchers here. People had been told that if they were thinking of buying a house in Abingdon they would all get jobs in the near vacinity so they had no need of a car. There would be no cars on the new estate. As I travelled on at the North Abingdon exit to Abingdon I saw on the other side of the road lots of workmen and a sign saying, the North Abingdon Diamond Interchange is being built. However, as I looked the men and the sign faded to nothing. I realised that it was just a mirage caused by the traffic fumes of all the cars using the Abingdon Ring Road to access the Tesco Roundabout. Bloomin’ heck Janet….I got really excited then! Janet keep on keeping on, it’s 6!pm on Friday and it’s taken me 25 mins to get from the anchor to high st! There’s a flood outside the Brewert Tap and another at the bottom of Ock st, the keep left bollards on the island are laying in the road, at the Caldecott roundabout a telegraph pole has snapped and laid on the grass, next to that a lamp post is bent over with the actual lamp missing ( for 6 months) tonight high street will be grid locked with parked taxis, meanwhile the delivery cars operating from the takeaways in Bath street will be all over, and blocking the paving, and do it goes on, do you know what? It will be the same tomorrow and the day after etc etc and as much as the cinema may be an overdue town asset I suggest there are more important issues to address and spend our money on! Point taken re. how ineffectual would be the role of a lone independent, or even a lone representative of the Labour Party. as evidenced by the young Labour fella who was elected to the TC a while back and was given responsibility for some backwater portfolio. Not his fault as the juicy portfolios are always carved-up between the members of the largest party, regardless of competence. It’s also the case that, should you go along to any council event you’ll find that it’s conducted in an heavy atmosphere of fruitless tedium, which is intended, I’m sure, to alienate anyone thinking of taking a more active political role, but who wants to lead a fulfilling life. I’m sure this ‘Wall of Monotony’ is done on purpose as a barrier to public interest. Perhaps the juicy stuff is kept for those ‘closed sessions’? But what does all this have to do with St Edmunds chapel?